The adjusted protocol offers a clear improvement in understanding between the different approaches to simulation. Here, the adjusted protocol in use (black) and theory (red) of mass density fluctuations under both isothermal and isobaric ensembles converge for system sizes that are relevant to DFT studies. Enlarge Image. Water may seem like a known quantity. There are, however, still aspects of water that remain unknown to scientists. Pure water, that is water without any additional trace material, still has complex properties that are yet to be fully understood by scientists. To unlock these properties, scientists use density functional theory (DFT), a framework of electronic structure, to study the forces and interaction between water molecules. 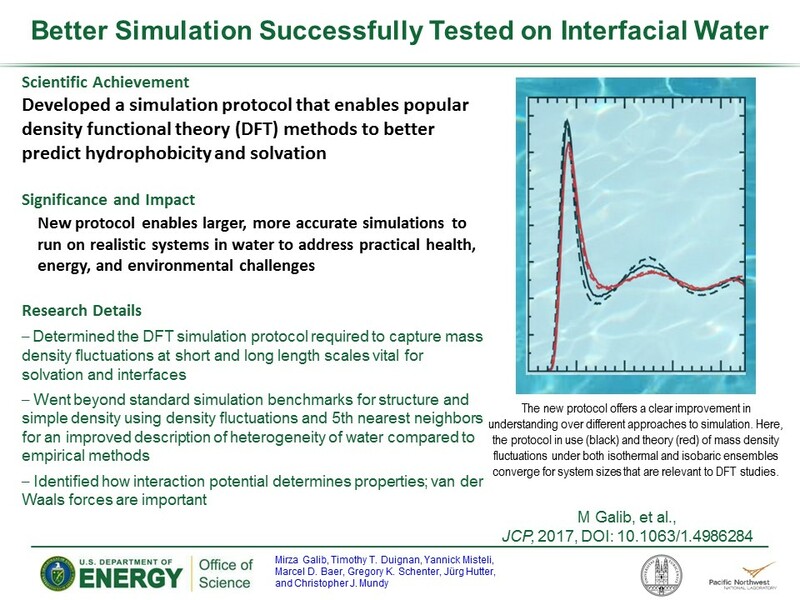 Pacific Northwest National Laboratory (PNNL) scientists led by Mirza Galib, Gregory K. Schenter and Christopher J. Mundy tested an adjusted DFT simulation protocol to prove that it can be extended to simulate more complex water properties. The tests proved successful in simulating baseline water measurements. Why It Matters: Water is deceptive in its complexity. Pure water contains a hydrogen-bonding network due to the negative oxygen ions wanting to bond with the positive hydrogen ions. A lot of the properties of water rely on creating and breaking these hydrogen bonds and a certain rate, time and energy. For liquid water in some complicated, stressed and heterogeneous surroundings, some of the properties of water have yet to be fully understood. Scientists use computer simulations to simulate these properties. These simulations need to be properly calibrated to ensure the quality of data produced. Water is a universal solvent. Its properties and response control many processes and phenomena. Its fundamental understanding can be extended to resolution of practical health, energy and the environmental challenges. Methods: The dynamic and structural properties of water can be analyzed through advanced computer simulations. Using high-powered computers, scientists have used quantum mechanical technique that are grounded in DFT. A quantum mechanical method, DFT is used in physics, chemistry and material sciences to examine the electronic structure of molecules, which refers to the properties of electrons in the electrostatic field surrounding the nuclei. The DFT is not without its faults. There have been many studies on the efficacy and accuracy of DFT especially as it pertains to bulk and interfacial water properties. The challenge for scientists is to build upon DFT to create a protocol that can effectively simulate complex and accurate water properties. “If we are good enough at understanding the forces between molecules using tools of statistical mechanics, we can tune, predict, control and understand these complex properties,” says Schenter, chemical scientist. Cleared slide summarizing research conducted at Pacific Northwest National Laboratory. Download PowerPoint slide. With this in mind, the PNNL scientists tested a revised version of the Perdew-Burke-Ernzerhof plus Grimme’s third generation of dispersion (revPBE-D3) to simulate a clear picture of mass density fluctuations in pure water. The test proved that revPBE-D3 protocol is accurate in determining baseline pure water measurements. 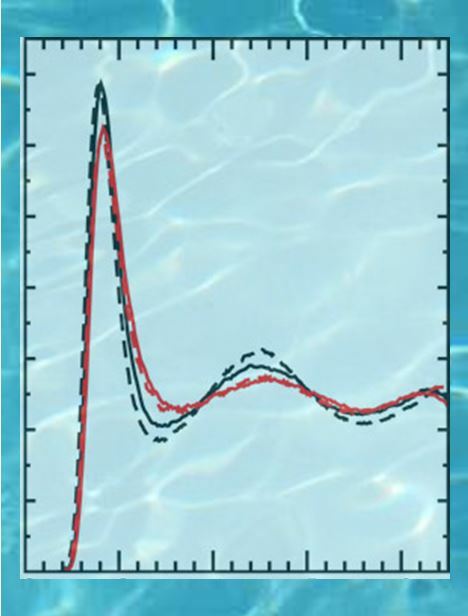 In addition, the results corroborated past studies of using DFT interaction potentials and cleared up inconsistencies in thermodynamic water properties. What’s Next? After proving the revPBE-D3 is accurate in simulating baseline water properties, the next step is to test more complex simulations using the same protocol. Facilities: This research used resources of the National Energy Research Scientific Computing Center, a DOE Office of Science User Facility. Additional computing resources were generously allocated by PNNL’s Institutional Computing program.